Greetings! It’s time for another Card of the Week spotlight, and this time we’ll be taking a look at Saiyan Spin Kick. 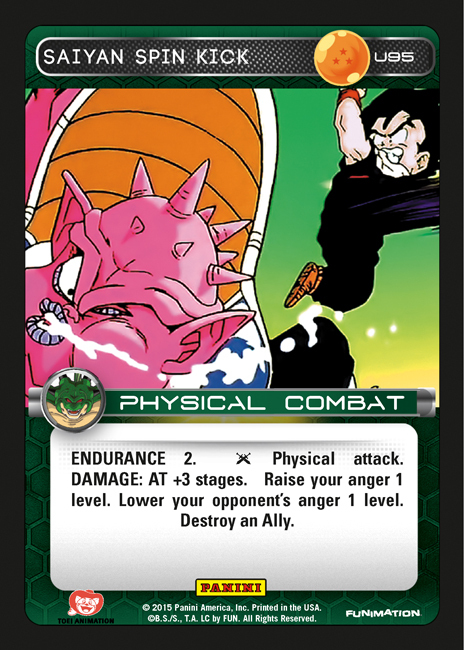 In Heroes & Villains, the Saiyan Style received a multitude of powerful new cards. When compared to some of the flashier effects like Saiyan Grab and Saiyan Charged Fist, it might be easy to overlook Saiyan Spin Kick. However, Saiyan Spin Kick is the kind of midrange effect that enables you to hedge against certain matchups without sacrificing overall consistency. First and foremost, it provides tempo oriented beatdown decks with a net +/- of three anger levels. Its damage output of AT +3 stages is reasonable, and Endurance 2 adds even more utility. Taking all of that into account, Saiyan Spin Kick is still noticeably useful even without the Ally destruction. Of course, it truly shines in matches where you can snipe a key card like Bulma – Genius or Captin Ginyu – Aggressive. While Saiyan Spin Kick doesn’t have a place in every deck, it is definitely a valuable tool to consider when tuning your decklist to compete against a specific metagame. My kind of card. Ally has always been saiyan’s problem. This card even gives you anger. I’d say it has a place any every Saiyan deck that’s not dedicated to energy attacks. Why wouldn’t you play this card in Saiyan? I think it’s just what then style needed, though it could still use a few more tools. Yup run my 3 in Saiyan Vegeta. Even works good in Saiyan Nappa too.